The Indian name quamash or camass persists in this 1-2′ tall perennial arising from deep-seated bulb. Flowers vary anywhere from white to deep blue or violet. Camassia Leichlinii, the larger of our two common species, is distinguished by the withering petals twisting together above the seed capsule rather than falling separately. It ranges west of the Cascades from southern British Columbia to southern Oregon and into Sierran California. 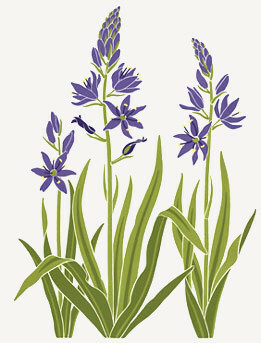 The starchy bulb of the camas was a prized staple for the native tribes in the Northwest. Care was required to avoid poisonous bulbs of another lily, the so-called death camas. Gathering camas root was the incentive for annual festivities, migrations to harvest ground where women dug and prepared bulbs (while the men engaged in sport and games). Handles of their digging sticks, fashioned from bone or antler, can be seen in museum collections. The sticks themselves, made of fire-hardened wood crooked and fattened at the end, have not survived so well. To prepare the root it was first cooked, either roasted elaborately in covered pits lined with hot stones, or boiled. It was then crushed in mortars and the gummy mass pressed into slabs for keeping. Hungry fur trapper Alexander Henry, in the Willamette Valley in 1814, tells in is diary of trading blue beads with the Kalapuyans for slabs of the nutritious food. As if to remind us of more meager times, each April and May the stately camas colors moist meadows and prairies, roadside ditches, or the vacant lot behind a supermarket, with handsome blue-violet blossoms.